If your friend jumped off a bridge would you jump too? Apparently. So my metaphysics topic was originally fight, flight, freeze reflexes in general but after the first blog post and the discussions based on those I kind of narrowed it down to if we are able to control those panic responses (determinism and free will with a good helping of biology). 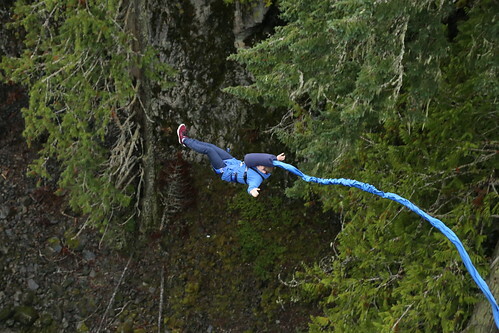 For my Phils Day Off, Matt and I went bungee jumping in Whistler. Thanks to Mr Jackson we were able to get a sweet deal and overall the day was pretty unforgettable. Going into Phil’s’ Day Off my question was mainly ‘Can you use willpower to control a panic response?’ and I was going to test this by literally just jumping off a bridge. I wanted to see if the effects of a panic response could be lessened by using relaxation strategies recommended by psychiatrists such as deep breathing and progressive muscle relaxation (Tensing and relaxing muscle groups one at a time). The day went pretty much according to plan (if you could really say there was a plan) Matt and I did the jump, tried to use various strategies to control panic, and also had just a lot of fun. The most effective way to overcome the panic response was to just jump as the panic didn’t really subside until the bottom of the jump. I was shaking pretty intensely while standing on the bridge and the progressive muscle relaxation didn’t really do anything to change that. Although I had very high levels of anxiety regarding the jump, the reality of doing the jump didn’t really sink in until standing on the bridge, hooked into the harness and rope, being told what to do at the end of the jump, until then it seemed as though I could still back out if I really wanted to but after getting into the harness it felt as though I had given up the freedom to back out. Higher levels of adrenaline may factor into this but after the worst of the jump I was like, ridiculously happy and amped up and I felt very alive. Essentially, I could control the circumstances that lead to the panic response (Not jumped, jumped forward not backward, closed my eyes, etc…) but the actual panic response was an uncontrollable thing where my higher functioning and “reasonable” brain shut down and my base survival instincts were left. Due to this I don’t have a very clear memory of the jump but I do remember some things and I have pictures and video of the event. I was also pretty interested in how personal history factors into panic responses, I go rock climbing fairly often so heights aren’t really a problem for me but in rock climbing the descent is always a very controlled thing and I’ve never been in the position of having to fall long distances. On the other hand, Matt has taken plenty of falls so while we both had plenty of anxiety about the jump we approached the same jump with different viewpoints. We did end up jumping differently, Matt faced off the bridge when he jumped and I faced the bridge when I jumped. Kind of going hand in hand with this, both of us screamed/swore during the fall but I started screaming as soon as my feet left the platform and Matt only swore once he was falling faster than he had ever fallen before. Matt also seemed more eager to do the jump but possibly not less anxious than I was. I could probably put this down to his prior experience with thrill seeking and how the highest thing I’ve ever jumped off of is like, the top of the bouldering wall at my gym (a solid less-than-one-eighth of the height of the bridge). So I would say yes, personal history factors into how panic responses affect you. If you consider a panic response (or at least the lead up to one) as your subconscious detecting a danger to your life and telling your body to freak out then people who can suppress a panic response are either REALLY bad at detecting dangers to life or have a very strong rational brain that can tell the subconscious to chill. 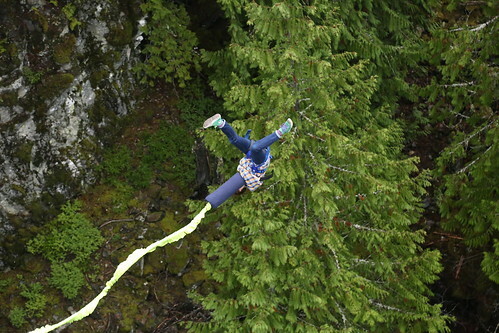 So basically bungee jumping was a really fun and terrifying way to experiment with willpower and panic responses and here’s a link to the pictures that got taken of Matt and my jumps.